Anne Frank was born on 12 June 1929 in Frankfurt, Germany. She lived with her mother Edith, her father Otto and her elder sister Margot. Anne and her family were Jewish. In 1933 Edith and Otto emigrated to Amsterdam in the Netherlands to escape increasing persecution against the Jewish community. Margot and Anne were sent to live with their grandmother in Aachen, West Germany. Margot joined her mother in Holland first, and Anne followed a few months later. For her 13th birthday Anne received a diary from her parents and began writing her diary that same day. ‘I want the diary to be my friend, and I’m going to call this friend Kitty’. Anne described herself as a daddy’s girl and felt less close to her mother and sister. She had many hobbies and particularly enjoyed reading and writing, researching family trees, Greek and Roman mythology, film stars and family photographs. At school Anne was described as a chatterbox, a quality she often got in trouble for. Her favourite subject was history and she hated algebra, geography and maths. Due to increasingly restrictive laws against the Jewish population, Otto had begun preparing for the family to go into hiding. In early July 1942 Margot was called up by the SS to go and work in Germany. To avoid Margot being sent away the family were forced to go into hiding earlier than planned. Their hiding place was an annexe in Otto’s office building, located on the second floor, hidden behind a bookcase. This soon became known as the Secret Annexe. The Frank family were later joined by another Jewish family – the van Pels (referred to as the van Daans in Anne’s diary). Hermann van Pels worked with Otto and he came to the annexe with his wife Auguste and their son Peter. In November 1942, Fritz Pfeffer, a German Jewish dentist, moved into the annexe, bringing the total number of people in hiding to eight. They lived in relative safety for more than two years but this would not have been possible without the help of several brave employees working in the building. Victor Kugler, a colleague of Otto, brought them books, magazines and news from outside as well as food and clothing which he obtained from the black market. Johannes Kleiman, a bookkeeper, visited often to keep the families’ spirits up and two secretaries, Miep Gies and Bep Voskuijl provided additional clothing, and more food. To distract Anne and Margot and to continue their education, Bep set up a shorthand and Latin correspondence course for them. Jan, Miep’s husband, forged ration cards and they were also given meat and vegetables from a local butcher and greengrocer. Anne was a keen writer and when she wasn’t writing in her diary she spent time writing a number of short stories, and also began writing a novel called Cady’s Life. Anne’s last diary entry is dated 1 August 1944. Three days later, on 4 August, Anne and the seven other residents of the annexe were discovered and arrested. They were taken to a prison in Amsterdam before being transferred to Westerbork, a transit camp for Jews located in the north of Holland. On 3 September 1944 they were all deported to Auschwitz concentration camp. The pages of Anne’s diary were found scattered across the floor of the annexe by Miep, who decided to keep them safe. A couple of months later, Anne and her sister Margot were taken to Bergen-Belsen concentration camp near Hanover, Germany, where they both died of typhus. Whilst the exact date is unknown, Anne and Margot died in February 1945, only a few weeks before the camp was liberated on 15 April. Otto was the only member of Anne’s immediate family to survive the Holocaust. He was given the pages of Anne’s diary and decided to honour his daughter’s memory by publishing it. The diary was published for the first time in 1947 under the title The Diary of a Young Girl. Anne’s diary has been read by millions of people around the world and has been translated into 70 languages. 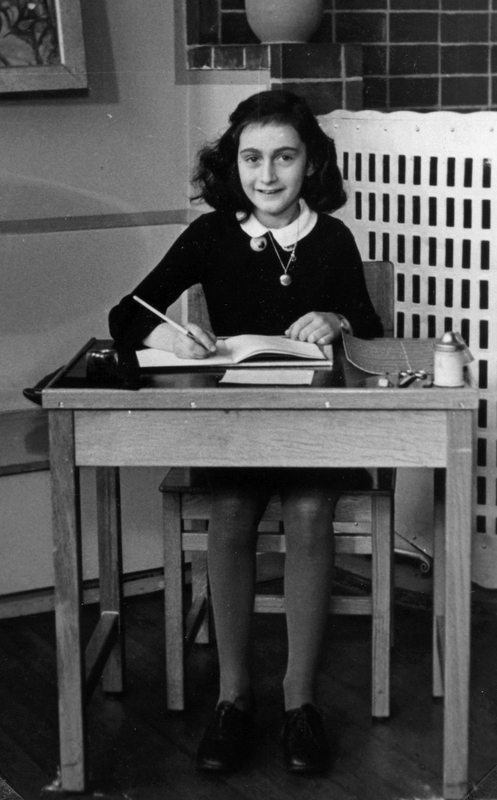 The Anne Frank Trust UK uses Anne’s life and diary to empower young people with the knowledge, skills and confidence to challenge all forms of prejudice and discrimination. Co-founder and Vice President of the Anne Frank Trust UK, Gillian Walnes MBE, said ‘The lasting interest and inspiration of Anne Frank’s diary is due not only to the continuing relevance of her writing…but also the vision and tenacity of a loving father, Otto Frank, who despite having come through the hell of Auschwitz, was determined that his daughter’s diary should be used as a ‘force for good’’.